MBL’s Noble Line electronics sit midway between its ultra-expensive Reference Line offerings and its least costly Corona gear. 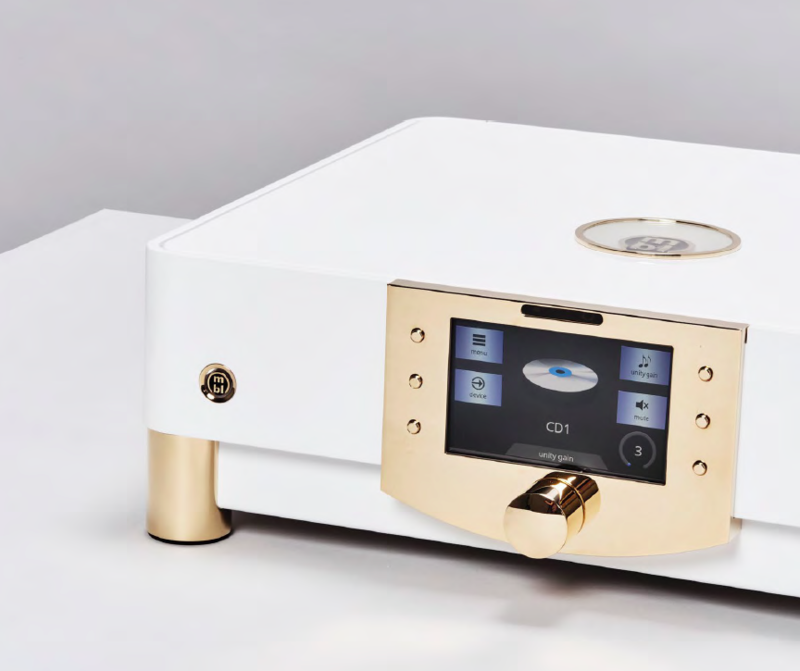 Though the Noble N11 preamp and N15 monoblock amps aren’t stripped down compared to their Reference counterparts, they do differ in price, size, power, and mode of operation. The enormous $106k/pr. Reference Line 9011 monoblocks, for example, one of the world’s great amps, generate 840W/50A/100V into a 4-ohm load, have a signal-to-noise ratio of 118dB and distortion of under 0.001%, and run in Class AB. The far lighter, more compact, $35k/pr. Noble Line N15 monoblocks still generate a hefty 560W/36A into a 4-ohm load, also have low noise, but run in Class D.
Now, it’s been better than a decade-and-a-half since yours truly reviewed Class D amplifiers in TAS. (Loved them in the bass, not so much in the upper midrange and treble.) Since then Class D has gained a firmer foothold in the high end, particularly in products like self-powered loudspeakers and active subwoofers where Class D’s exceptional efficiency, small size, low generation of heat, and relative affordability are obvious plusses. Often erroneously called “digital” amplifiers, Class D (or “switching”) amplifiers do not work like linear amps, in which the input is sent directly to the amplifier’s various gain stages for boosting. In a Class D amp the input is first converted/encoded by a modulator into a pulse train (using pulse width, pulse density, or related modulatory techniques) that represents the amplitude variations of the audio signal. This pulse train is then fed to the amplifying devices (usually MOSFETs), which operate like electronic on-off switches. Working alternately, these transistors switch back and forth between the supply rails, generating positive and negative boosted signals that are subsequently low-pass filtered (to get rid of the very high frequencies used by the modulator to encode the input signal), sometimes high-pass filtered (to reduce residual distortion), and fed as a higher-gain analog (sinusoidal) signal to the loudspeakers. Theoretically, a switching amplifier (which dissipates virtually no power as heat) has an efficiency of 100%, while Class B amps have a theoretical maximum efficiency of 78% and Class A amps 20–50%. Unlike its predecessors and much of its current competition, the Noble Line N15 monoblocks under review are said to guarantee a linear signal independent of load, level, or frequency. This is a bold claim, considering (as MBL itself points out in its LASA 2.0 white paper) that Class D amplifiers inherently distort the music signal depending on frequency. (Natively they have low THD in the bass and very high THD in the treble.) Moreover, Class D amplifiers are always designed for a particular resistance value (e.g., 4 ohms), but a loudspeaker does not have a constant resistance—it is a “complex load” with impedances varying with frequency. Thus, in addition to their native non-homogeneous distortion profile, Class D amplifiers change their power delivery (and hence their frequency response) with changes in load. On top of this, the louder a typical Class D amp plays, the lower its overall distortion, and (paradoxically) the quieter it plays, the higher its distortion. MBL claims to have solved these myriad problems with its LASA (Linear Analog Switching Amplifier) 2.0 technology, which, instead of the typical and economical switch-mode power supplies of most Class D amplifiers, uses a massive analog toroidal power supply. The LASA circuitry is also symmetrical in layout for better common mode rejection, employs low-drop fast-recovery rectifiers to create a low-noise supply voltage, and has a “soft-clipping” provision to eliminate aggressiveness and distortion at very high output levels. Whether or not these strategies result in an amp that (as MBL claims) is closer to Class A or Class AB in linearity, noise, and stability than it is to typical Class D, there is no question that the N15 differs sonically from the switching amplifiers I auditioned lo these many years ago. During most of the review period I used the N15 with its companion Noble Line linestage preamp—the single-gain-stage, high-bandwidth, Class AB N11, often run in “unity gain mode” (about which I will have more to say in a moment)—driving a cone loudspeaker that presents a moderately difficult load (the Magico M3) and sourced by Walker and TW Acustic analog and MSB digital. To be honest I didn’t expect the world from this combination, especially since I’m used to listening to the Magicos with much higher priced Class A/AB electronics from Soulution and Constellation. And, to be honest, I didn’t get the world—or all of it. But what I did get was good enough and surprising enough to make me re-think what Class D (or at least MBL’s LASA 2.0 version of it) has to offer. For one (perhaps most important) thing, the N11/N15 combo did not have all of the treble-range eccentricities that I remembered from earlier-gen Class D. Where Class D’s top octaves used to sound as if they were roughened in the low-to-mid treble and abruptly rolled off above that, the MBLs’ high frequencies did not. (They were just a bit on the soft, sweet, dark side with a relatively insignificant reduction of “air.”) For another, the N11/N15 did not have the almost-digital flatness of aspect in the midrange that I also remembered from early Class D. No, the MBL gear had three-dimensional imaging in the mids (and in the treble and bass, too). And in the area where Class D was always at its best, the bottom octaves, the N11/N15 did not lose a step, sounding just as powerful, tightly controlled, and deeply extended as earlier Class D, with (as noted) the added bonus of three-dimensional bloom.